On an uneven day that saw periods of sunny, warm conditions mixed with spells of clouds and cool breezes, the Cardinals had ups and downs, highs and lows, triumphs and heartbreak. A heavy early-evening thunderstorm wiped out Thursday’s final event – the 4×400 relay – and forced teams to return Friday to conclude the district competition. Boone Central finished on a high note as the girls 4×400 team placed second, giving the Cardinals nine qualifiers for this week’s state track and field championships at Omaha Burke. The Boone Central Lady Cardinals had a solid district meet, placing second as a team and qualifying seven athletes for state, but were no match for a deep and talented Scotus squad. The Shamrocks, led by Amber Ewers’ four gold-medal performances, amassed 144 points to the Cardinals’ 71. The BC boys finished seventh in the team standings and had two state meet qualifiers. “Once again, the weather played a role in this meet, but our kids competed with the best of them,” said Boone Central Coach Kris Pestel. “All of our athletes gave their best efforts. Some qualified for state, some didn’t and others had personal bests, but the key was the effort given by all. “The B4 District is always stacked with some of the best athletes in the state and this year was no exception. Our kids competed very well with the best in a tough district that took two days to complete. 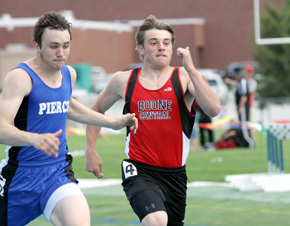 Reflecting the quality of competition pushing athletes to their best, two Cardinals set Boone Central school records despite not winning their events. Freshman Jade Gottier broke the 800 meter run mark she had set a week earlier, placing third and qualifying for state with a time of 2:29.1. Junior Jaime Kennedy was second to Ewers in a ‘bang-bang’ 200 meter dash final, establishing a BC record time of 25.6. Along with that highlight, Kennedy suffered one of the major heartbreaks of the meet, false-starting in the 100 meter dash final after running the top time in preliminaries. 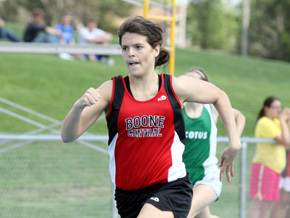 She rebounded with the 200 performance and also helped Boone Central relay teams qualify in the 4×100 and 4×400 events. The 4×100 relay team of Brooke Anderson, Kennedy, Breann Thorberg and Bobbi Beckwith won gold medals with a 50.8 season-best performance. 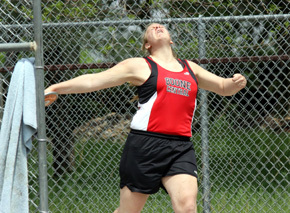 Senior Sara Wells was the other Cardinal gold medal winner, taking the discus competition with a mark of 133-2. Bobbi Beckwith joined Kennedy with a runner-up performance in the 400 meter dash (1:01.5) behind Ewers. Beckwith also anchored the 4×100 and 4×400 relays. The 4×400 team of Gottier, Kennedy, Thorberg and Beckwith placed second to Scotus Friday in 4:11.2. Kattie Cleveland gained a state berth by placing third in the discus with a throw of 115-5. Sophomore Blake Slizoski will compete in the state meet 100 and 200 meter dashes for the second straight year. Slizoski placed third in both B4 events, with times of 11.62 in the 100 and 23.0 in the 200. Junior Cole Luettel went two inches over his previous best in the high jump (6-3) to place third and qualify for the state championships. Complete Boone Central Results in Print & Online Editions of Albion News.